Energy Star Program For Homes And Appliances Is On Trump's Chopping Block : The Two-Way Appliance makers and home builders are in Washington, D.C., to celebrate the energy efficiency program. Energy Star is among 50 EPA programs that would be eliminated under the president's budget plan. The Energy Star program started in 1992 to rate the efficiency of computer monitors and now covers dozens of product categories. "The Energy Star brand has brand recognition on par with, like, Coke and Pepsi," says Steve Byers, CEO of EnergyLogic. His company, which is among those receiving an Energy Star award at this year's event, inspects buildings to make sure they qualify for the program's seal of approval. "This is a very successful program," he says. "I don't know what more one could want out of a government program." Critics of Energy Star say the government should get involved in the marketplace only when absolutely necessary. But that argument doesn't hold sway for the program's legions of supporters, which span nonprofits, companies and trade groups. "These cuts make no sense," says Lowell Ungar, senior policy adviser with the nonprofit American Council for an Energy-Efficient Economy. His group, along with about 80 other nonprofits and companies, has written to Congress urging it to keep the program. More than 1,000 companies have called for strengthening the program in another letter, organized by the Alliance to Save Energy. "The bottom line is proposed cuts to Energy Star would harm American consumers, they would destroy jobs, and they would make air pollution worse," Ungar says. The federal government launched Energy Star in 1992 to rate the efficiency of computer monitors. Now it covers dozens of product categories, from washers to electronics and homes. Here's how it works: The government sets criteria for efficient products. A third party inspects goods or housing, and if they meet the criteria, manufacturers can use the familiar blue sticker to market the product as energy-efficient. In a North Denver development called Midtown, Steve Eagleburger of EnergyLogic was recently inspecting a home while construction workers put on finishing touches. This part of the Energy Star program has existed since 1995. "What we're doing here is checking to make sure this attic is insulated," Eagleburger said as he stood on a ladder and peered through a raised attic hatch. "This one is not insulated at all." He makes a note on a tablet, then he's off to the next thing — a checklist of dozens of items such as fans and air-duct seals. This house won't get the Energy Star label unless it fulfills all the requirements. Energy Star is a voluntary program. It costs about $50 million a year to run, but punches above its weight in impact. In 2014, the EPA estimates the program helped American consumers and businesses save $34 billion and prevent more than 300 million metric tons of greenhouse gas emissions. A study published last month in the journal Nature Energy found that Energy Star-rated buildings in Los Angeles used nearly 20 percent less energy compared with other buildings. The little blue label also has an audience in countries such as Mexico and Canada. "We do see that actually as a distinguishing factor," says Mike Gazzano of Delta Products, which makes fans for bathroom ventilation and other uses. He says customers consider Energy Star the mark of "a premium product" in terms of engineering and technology. The idea for eliminating Energy Star might have come from conservative groups such as the Heritage Foundation, which targets a range of efficiency programs in its own budget blueprint. "This is something that the private sector can market and sell as a great quality for their product. So why is the government trying to nudge people in one direction when they simply shouldn't need to," says Nick Loris, an energy and environment policy fellow at the foundation. Another critic is Myron Ebell, a climate change skeptic with the Competitive Enterprise Institute and head of Trump's EPA transition team. 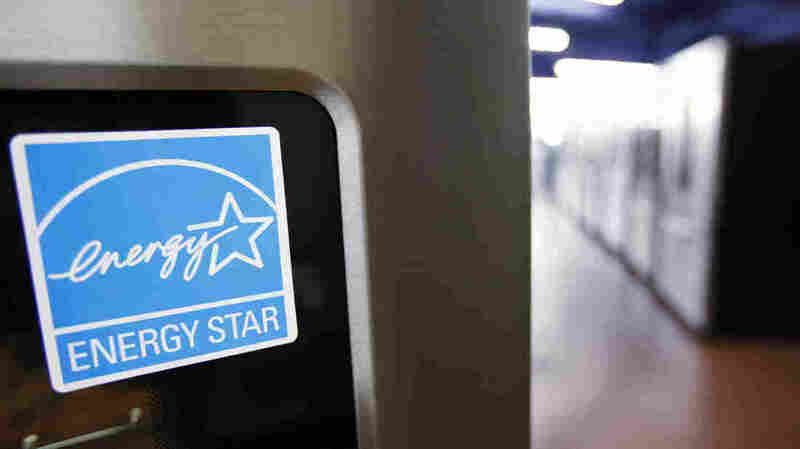 "It's good that Energy Star is a voluntary program," he says in a statement, "but it's not clear why taxpayer dollars should be used to promote some products over other products." Energy Star has also weathered a scandal. In 2010, workers at the Government Accountability Office posed as product developers and got the Energy Star label for fictitious products. That launched the third-party certification that exists now. Doug Johnson, vice president of technology policy with the trade group Consumer Technology Association, says that process can take time out of the already crunched product development cycle. "It's a part of the program that we think should be reexamined," he says. "In fact we've been advocates for improving that part of the Energy Star program." Johnson says there are other successful federal programs such as EnergyGuide that measure efficiency. Still, he doesn't think the entire Energy Star program should go away. Ultimately, it will be up to Congress to decide whether shoppers continue to see the familiar blue sticker on goods in the showroom. Grace Hood is an energy and environment reporter with Colorado Public Radio. You can follow her @gracehood.